If your basketball court becomes damaged or worn out, it may be necessary to carry out basketball court repairs to restore it back to its original performance characteristics. Damage to a basketball court could include holes in the surface or the anti slip paint and line markings wearing away, this could occur as a result of overuse, vandalism or lack of cleaning and maintenance, and basketball court repairs may be necessary. You can talk to us today if you’d like some advice on how to fix a damaged sports court. We offer these services so we’d be happy to give you a quote for any repair work which might be needed. If an adequate maintenance plan is not put into place for a basketball surface, this can result in a number of problems for the facility including a loss of water drainage, flooding, and loss of the anti slip qualities which could lead to the surface becoming unsafe for use. 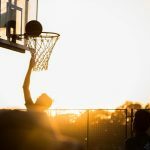 If any of these issues do occur, it is vital that basketball court repairs are carried out as soon as possible to prevent any damage becoming worse and leading to more serious and costly problems. Repairs for a basketball court can include repainting and reline marking with anti slip colour coatings, as well as surface repairs to any damaged areas. If these basketball court repairs aren’t carried out straight away the court might need to be resurfaced in the future which would of course be a lot more expensive than minor maintenance and repairs. Carrying out regular maintenance such as brushing, removing debris and applying chemical treatments to prevent the growth of moss and algae which can contaminate the surface and lead to a loss of drainage. 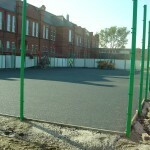 We are specialist sport surfacing contractors with a wealth of experience in the installation and maintenance of a wide variety of sports facilities. 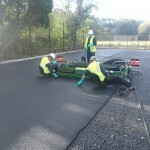 If you think you need basketball court repairs carried out for your sports surface, please fill in our contact form with your details and one of our staff will get back to you with some helpful advice regarding quotes and prices.